It was another busy week here, and some things just take longer when you have help! I had to make some "Bags o' Bling" for an order that is headed to Australia. When I make bling, there are a LOT of small pieces spread out on the table. A LOT! And guess who thought he needed to walk right through the middle of it? I was afraid if I tried to move him it would make a bigger mess! The good news is that the bling is finished and all of the beads and other paraphernalia is safely put away. No harm came to Ozzie, the beads, or me in this process! And then there's Callie. As soon as I start winding bobbins and cleaning out the lint she comes running and has to help. Even though she clearly thinks otherwise, her paw is not a good lint mitt. And in the evenings I have been stitching away on the bottom border for Sunflower Gatherings (block of the week from Primitive Gatherings 2 years ago...YES, TWO years ago). Finished the stitching and now need to sew all of the borders on and get the rest of the wool steamed down. I am definitely on the down hill side of this project and that is exciting! And the "I" block - it will spell out "Let It Snow". I tried blanket stitching around the stars but they are too small and it didn't look good. I think this is better, and it was faster! I've also been busy shipping out charms this week - Charming 4 is almost over already! Just one more. I wasn't going to offer this program again, but I've had quite a few requests, so maybe we will do it again. More good news on the jewelry front - the new Iowa Quilt Museum has only been open a week and they already placed a 2nd order for jewelry! Been busy working on that and need to finish it up today. I'm sure my furry helpers will be up to the task! I put these on my website this morning...cute little red scissors and a US flag fob. We sell these (and quite a few other) scissors at shows, but I have a limited number of slots on my website, so I've never added them there. We've sold tons of fobs lately and I thought it might be fun to offer them together. I've listed them a little cheaper than if you bought them separately. Lisa Bongean from Primitive Gatherings sent me some of her brand new Christmas Gatherings fabrics to play with. These will be pendants soon. I love the colors in this line - red, green and cheddar - they are so pretty! And of course, I always like it when there are tiny little prints that I can put in the center. Perfect! And speaking of Primitive Gatherings - look at this! Not a great picture but you can see that this is the bottom border of Sunflower Gatherings - I'm so excited! I have most of it stitched down now and then will add the other 3 borders - not a lot of stitching on those but it might take awhile to get the vine placed correctly. Definitely getting closer to a finish on this one! And look at how cute this is! 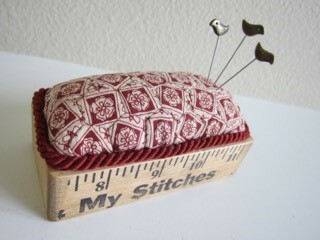 My customer, Pattiann, bought one of our cute little ruler boxes and turned it into an awesome pin cushion! Look at those tiny hexies! I really love this - thanks Pattiann for sharing it with me! I had to snap a picture of this pretty sunset on our way home from my niece's soccer game last week. You never know what you might see from my sewing room windows. There are lots of deer in our area, but we usually see them on the other side of the pond. The other day I looked out and they were chomping on cat nip (that might be interesting later) on CC's grave. Then they started chewing on small trees so I yelled and they ran off. I don't think hubby would appreciate them eating the fruit trees and the garden! We finally had some perfect spring days and I just had to sit on the deck for awhile. Isn't that a pretty blue sky? If you know me, you know that I LOVE a fun mail day! We decided that we want to be a part of YOUR fun mail day, so we are starting this brand new program called “Surprise!”. In these Surprise boxes we will be including some of our handmade items and also a few things that we sell at shows, but that we don’t have room for on our website, such as handmade pin cushions and other one-of-a-kind things. In this program I’m planning to include a brand new shape/size of ruler box, that no one else has seen yet, and some other little surprises along the way. This will not be like some of those programs, where you get a bunch of things that you won't like or use. This will be good stuff - the things that we make ourselves, sell at shows when we vend, and some of my favorite things. The picture shows some of the items that may be included. Do you struggle trying to find new and unique gifts for your quilty friends? Treat them with fun mail too! This would be the perfect gift for a friend! By purchasing “Surprise!” you are committing to the full 6 month program where, starting in July, you will receive 3 shipments - one every-other month. Your first payment secures your spot for the entire program. With each new shipment you will receive an electronic invoice for $35.00, (which includes S&H within the US) that can be paid using a credit card, or PayPal. Space in this program is very limited, so sign up now to secure your spot! We will ship these internationally, but will have to add some shipping for those. Go to our website to order your Surprise box now! I recently finished Home for the Holidays by Primitive Gatherings and the ONLY way I got that accomplished was because I jumped on the Sew Along bandwagon on Instagram! It is a quilt that I had hoped to make for a couple of years, but just didn't ever get it started. Seeing that there was a group on IG gave me that little push that I needed! Now I am determined to finish Sunflower Gatherings (also a Primitive Gatherings design). I've had all of the blocks stitched and pieced and just needed to put it together. There is a lot of stitching that overlaps onto other blocks/rows/borders, so that is what I'm doing now. The center is together and the first border is on. I have all of the wool pieces prepped and ready for the final border - exciting! I don't have a lot of time to work on it, but you would be surprised at how much you can do in an hour or two in the evening. She has done this as a BOM for a long time, but is now offering it as a full kit, see it here. You have to purchase the pattern separately. 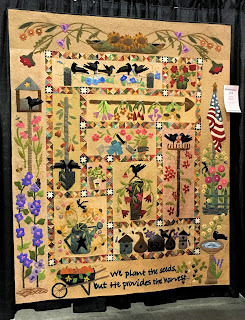 When I was in Paducah there was a version of this quilt there - I really love the flag that she added on the right border! I'm really sorry that I can't give credit to the person who made this beautiful quilt, but I can't quite read the name - I think it is Rosemary ??? Nancy has a Pinterest board for this quilt, and I have done the same - see it here... I love some of the little details that people have added to their quilts and be sure to check out the picture that has TWO of these! I read that they were made by a mother and a daughter. 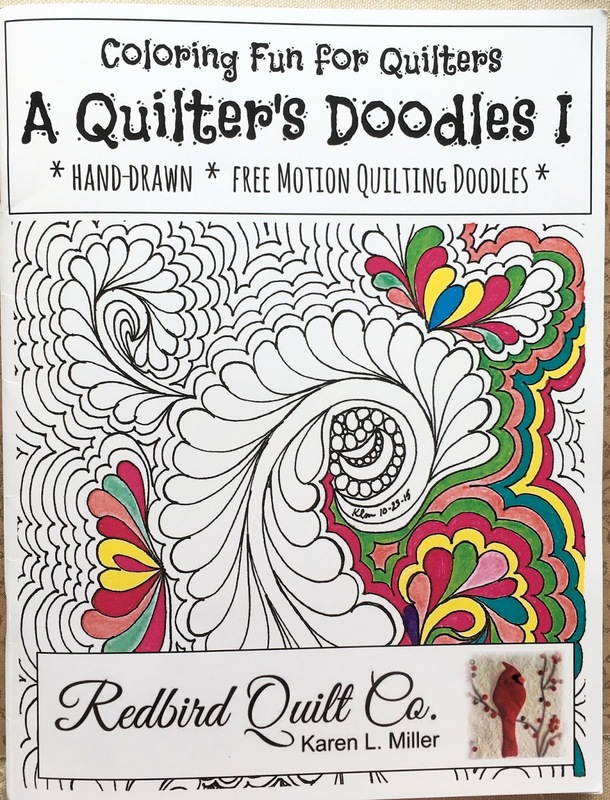 I will be hosting this SAL with Heather from Mountain Home Quilts. We will both be posting information on our blogs and we can all post on Instagram. We have also decided to start a Facebook page for this SAL so that we can better communicate with everyone. I love IG - but it's best for just posting pictures - not a lot of dialogue, and for this project we decided it would be nice to be able to have more conversations. This will be a closed group, so you will need to request to join - check it out here. Here are the few details that we know so far...we will not be starting this until the fall - September/October. Until then you can start gathering everything you will need. Ordering the kit will take a lot of work out of this, but I will be using my stash, so that will take some thought! Lisa at Primitive Gatherings also offers a thread kit for this, if you don't have a thread stash. I use Steam A Seam Lite 2 for all of my wool applique - so that is something else to think about - if you use a product like this you will need quite a bit for this project. Our plan is to do it just as the pattern is laid out - which will take 14 months. It is completely up to you how you handle it - there will be NO RULES, just a guideline to follow if you choose. We are doing this because it's a gorgeous quilt and I know for me, I probably won't get it done if I just work on it by myself. Seeing everyone's pictures and progress along the way really helps you stay motivated. And it's a great way to meet some new quilty friends! I'm sure we will have some fun stuff along the way - maybe a giveaway - we will figure it out as we go. Hope you decide to play along! If you are interested in making this quilt with us, be sure to go sign up for the Facebook page and we will start getting to know each other! Do you like to color? I have always loved to color - I remember having those great big posters that were a huge coloring page - did you have those? I wish I knew where mine were...one had butterflies and flowers all over it. So fun! I, for one, am thrilled that adult coloring books are now "the thing"! My sister-in-law gave me one for Christmas, and my friend, Nancy gave me one for my birthday - with a big package of markers. Amazing! I love the look of the rainbow of markers. Or a big box of new crayons...so pretty! Oh....another thing I have always loved is the big wall of towels in large department stores. I'm just drawn to that array of gorgeous colors! Ok...back to what I was really going to post about (but think of me the next time you look at one of those pretty towel walls!). Marcie posted some bittersweet news on her blog last week - she is retiring from pattern publishing. I'm sad because I really do love all of her patterns, but I sure am happy for her! Now she doesn't have to worry about the pressure of it all. I know a lot of people think it's all fun and games, but it really isn't! It's a lot of work to write and publish patterns, and to get them out there in the market. Running a small business is not easy, and I don't blame her for being ready to retire. You can read her blog post here. She is going to sell the patterns that she currently has in stock, and when they are gone...they're gone. She will then be deleting her website, so you know what that means. You better go get them now, while you still can! And there are tons more - go take a look! Do you do hand work? I try to stitch each night for an hour or so, whether it's hand quilting, or working on one of my many wool applique projects. I always say that it's amazing how much you can get done, when you actually WORK on it! On the little table by my stitching chair I keep a couple of our ruler boxes. I like this tiny one with the lid for my thimble and wax (and a couple of needles stuck in my wax!). It's nice because then they don't roll away, get lost in the drawer, or get stolen by a cat! I also love my pretty Dovo scissors, and my scissor fob - but I keep them safely in the drawer. I'm so excited to have this all put together and really owe it to the Instagram sew-along group. I never would have gotten this started, let alone finished, without that little push. We are talking about starting Primitive Gardens next, so if you are interested, be sure to keep an eye out for that. I want to wait until I finish Sunflower Gatherings - the block of the week from 2014 - also from Primitive Gatherings. I've been working hard to get it closer to the finish line. I had the blocks all stitched and even a couple of rows sewn together, so it seemed crazy not to get back to work on it. Super excited to have the center together, but there is still a lot of work before it will be done. There are a couple of pieced borders and more wool applique. Hopefully the girls will wait awhile before starting the Garden quilt, because I don't think I can handle working on both of them. I just don't have the time to devote to it, I still have tons and tons of jewelry to make to get caught up. Here are a few pieces we recently finished - they are all 1 1/2". After I cut strips from all of the Songbird Gatherings fabric, Ozzie decided to lay on top of them. Makes it difficult to get work done! I hated to disrupt him (seriously...can you tell who runs this place?!) so I took pictures of his cuteness! Yesterday I was ironing some fabric (never clothes!!) and I could hear Ozzie snoring, but couldn't figure out where he was. A little later I saw him under my ironing station! No wonder I could hear those little snores. Now it's back to work - hope you have a great Sunday! Since we got this antique buffet, I've put some of my shipping items in it - Callie is obviously feeling helpful! Not sure what has gotten in to Ozzie - he never used to lay up here, but he's looking pretty cute! Not sure how well you can see this, but here is Tiger, one of our outside kitties...sitting on top of the squirrel feeder. Inside of the squirrel feeder is a bird! I didn't think the outcome would be good (for the bird), but Bailey came and barked at the cat, who ran up the tree, and the bird flew away! Now it's time to show you all of the good stuff that came home with me from Paducah! Aunt Nancy made Nancy (so many Nancys in my life!) and I each one of these cute bags - they were kits that she bought from Merry's Stitchins the last time she was there. They were perfect to hold all of my Valdani that we took on the trip. Thanks Aunt Nancy!! We found these lights at Merry's before we left for Paducah, but we also saw them in several booths at the show. They are really bright, and run on batteries or you can plug them into your computer, etc. You can move it around in all directions - super handy and they will be really nice to travel with - compact and very helpful in a hotel! Nancy and I both bought this kit from them - you can see a better picture on their website. And while you are there, be sure to check out the eagle pattern - it is truly amazing. We had a nice visit with Emily from The Little Red Hen. Have you heard of them? I'm lucky that their shop is only about 1 1/2 hours from my house (so I had to go all the way to Paducah to buy this kit! ), and it is awesome! They have tons of original patterns, loads of beautiful wool, and soon they will have their very first fabric line - I can't wait! Be sure to check out their website too - take the tour of the shop - it's really nice. They were also featured in Quilt Sampler and have a cute project available from that. Fun! So anyway...here is the kit I bought from them. I keep thinking I will make a fun bee project and thought this was really cute. Another shop that I love is Yellow Creek Quilt Designs. Vicki and Jill have been good customers of mine over the years - I met Vicki at the very first show that I ever vended (is that a word?) at. We had a nice visit with them, and I felt the need to bring this little treasure home with me! They have designed a couple of fabric lines and I got to play with the first one and make a bunch of pendants out of it to surprise Jill with - fun! I think I mentioned before that Betsy Chutchian had sent me some scraps of her beautiful line Lizzie's Legacies that is just getting to quilt shops now. I was happy to find some of it at Hancocks. The yellows and pinks are just perfect. Love them! They yellow is nice and soft - not washed out like it looks here. Here are some of the pretty wools that I bought. This little bundle also came from The Red Hen. I have a ton of wool, but most of it is dark and kind of blah. 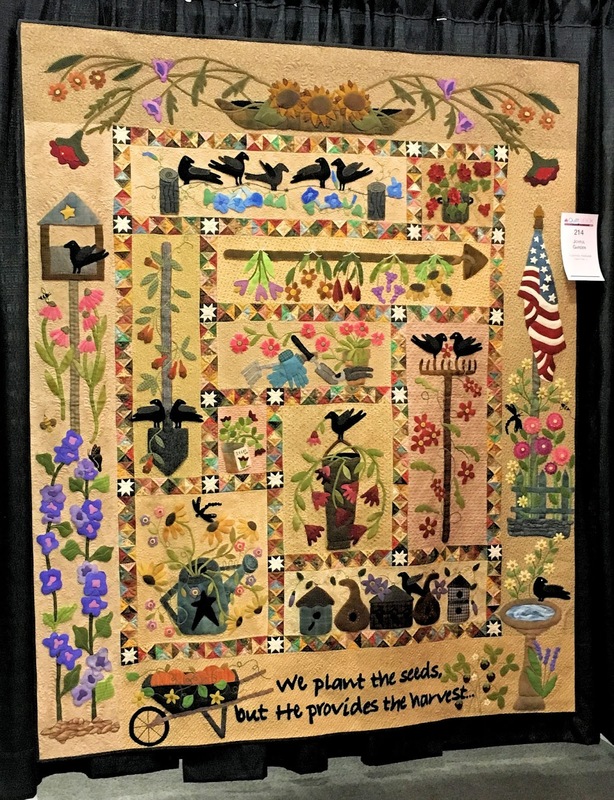 I WILL make the Primitive Gardens quilt (remember it from my post about the quilts in Paducah?) some day and will need some pretty and colorful wool - at least that is my excuse for buying these! I'm hoping some of the girls on Instagram will make this quilt with me. I want to wait a few months, because I'm back to working on my Sunflower Gatherings quilt and would really like to finish it first. And then I had a very weak moment and bought this!!! I really don't know what I was thinking, because the last thing that I need is another time consuming project (I need to get back to designing some quilts of my own!!). And another funny? We bought these (yes, Nancy got one too) from The Woolen Needle - another shop that is about 1 1/2 hours from me, but I go to Paducah to buy from. Guess this shows that I have some good shops in my neck of the woods! So that is all for now - looks like I should be busy for the next 200 years! Can you tell that we had a great time on our trip to Paducah!? I didn't take very many pictures of the vendors, because it was just too busy - too many people! But let me tell you...they were all awesome! Ok, so I guess the only pictures I took of the vendors was at Red Button! I swear I had more, but I'm not finding them. If you are on Instagram - take a look at @nancylovesquilts I know she posted some pics of vendors there. In the first half of the store, we really didn't find anything that we had to have. There were tons and tons of pretty batiks, but I don't normally use them. But in the second half we found lots of good stuff. I had been looking for some of Betsy Chutchian's new line called Lizzie's Legacy. Betsy sent me some of her leftovers so I could make some jewelry and I really fell in love with the pinks and soft yellows. Well, I found them at Hancock's and they now reside in my stash! I made some pretty pieces of jewelry with them yesterday. We also went to the Quilt Museum, which was really fantastic. They currently have a miniature exhibit that was truly amazing. Another let down for you who are reading this - they didn't allow pictures! If you ever have the chance to go there, make sure to do it. There were so many amazing quilts. The most interesting/different? One made from duct tape and one from beer cans! It's crazy how many different designs and colors of duct tape are out there. The quilt really was kind of cool. As we were standing there commenting on it, and checking it out...wondering how in the world she quilted through it, a man came up and said he was her husband! She was also in the building, but was at a book signing. He said that she had to actually make each hole with an awl. Thousands and thousands of holes! YIKES! The creativity of some people is just amazing to me! What they did allow us to take pictures of in the museum were some beautiful stained glass windows. My mom owns a stained glass studio/shop, so I'm always interested in pretty stained glass pieces. I think she should whip up some of these! Aren't they beautiful? Love them! I bought a few T-shirts at the shop, but that was it. I was really tempted to buy the book that showed most of the quilts on display, but I just didn't want to lug it around. Now I kind of wish that I would have gotten it, but it can probably be ordered online, so maybe I'll do that. So we took a ride in this to get us to our bus a bit quicker! And on a totally different topic than Paducah...I haven't shown you any kitty pictures for awhile, so in case you are wondering...Ozzie and Callie are just fine, and are still as adorable as ever! I love this picture of him - I'm hand quilting and he wants me to stop so he can sit in my lap. Seriously...I can not resist this face! Sorry about the super-grubby ironing board that these are on! Ignore that and just look at the earrings and scissor fobs! That's all for now, this got way longer than I had intended. Back to work for me! If you want to see any more of my jewelry, just go to my website.